Title: I Am NOT Going to Get Up Today! But you’re wasting your time. Divide students into 5 equal teams with the first person from each team standing inside a starting hoop. On the signal to begin, these players pick up a sponge from the trashcan filled with water. The must pass the sponge over their head to the next person in line. The players continue passing the sponge over their heads until it gets to the last player in line. The last person squeezes the sponge into a bowl then this person will take the sponge back to the front of the line, dunk the sponge in the trashcan and begin passing it over their heads again. Teams will continue to go until time has been called. The team with the most water in the bowl wins. 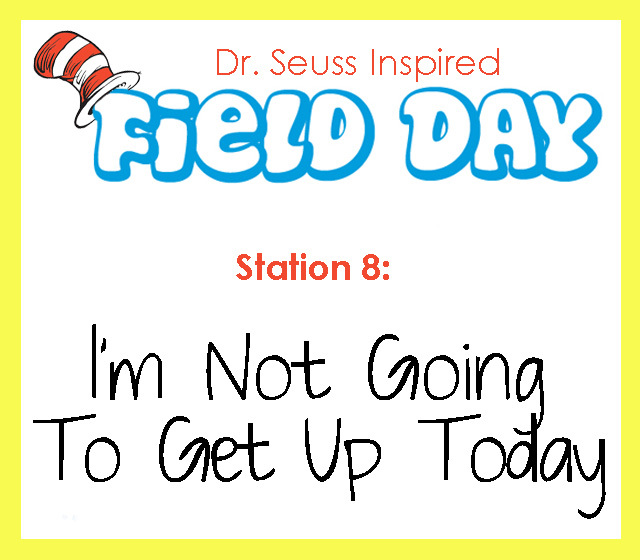 This entry was posted in End of the Year, Games, PE & Health and tagged Children, Dr. Seuss, Education, Elementary School, Games, Kids, outside games, PE & Health, Teacher Resources, Teachers, Teaching by Squarehead Teachers. Bookmark the permalink.